The Zografina Studios are a family run complex situated in the Kefalos resort that feature a great location for those looking to enjoy a great holiday on the island of Kos with its great beaches and colourful towns. 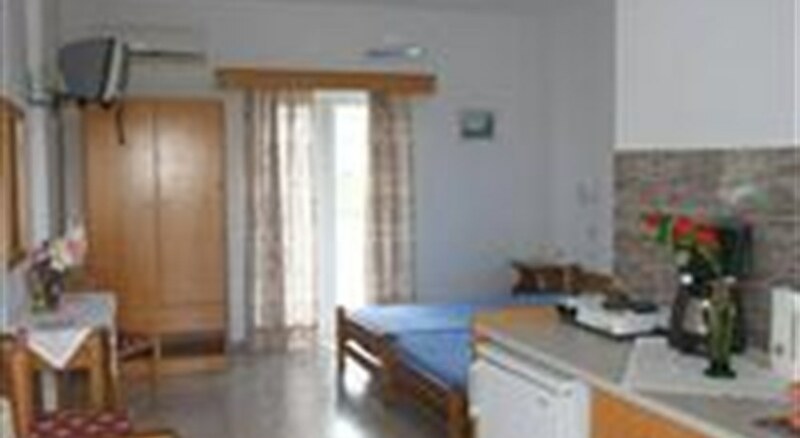 The studios offer basic and affordable accommodation with a collection of large rooms complete with self-catering facilities for the freedom of enjoying your holiday how you want. You can find the nearest beach just 200m away and the resort centre with all its shops, restaurants and cafés not much further at around 1km for all the amenities you need to enjoy your holiday. When you are looking for a way to cool off guests staying at the apartments need not go far as they can use the pool located at the adjacent Athinoula hotel. The island of Kos is a great place to go if you are looking for plenty of water sports, especially windsurfing with plenty of chances to try on offer at the beaches, along with diving centres so you can even go out on scuba diving excursions and lessons for a memorable experience. Kos is the 3rd largest island of the Greek islands and along with Rhodes is one of the more popular choices for tourists and holidays. The island’s town is Kos Town with a mixture of Venetian, Ottoman and modern architecture makes for interesting days out should you choose to explore its many shops, cafés and restaurants. The island also offers several historical and fascinating sites that are well worth a visit with ancient castles and monuments such as the Roman Odean coliseum and the Nerantzia Castle.